Decent Northerly breeze for the race back and probably a few sore heads after the Saturday night celebrations. Zig-zag course down the Solent with the boat going better and we kept ahead of Brazer who looked a little under powered with a No. 4 as we were using our No. 3. Beat all the way to Hill Head and then onto East Bramble which allowed us to get the 90% kite up although it was a bit tight. Bit of a messy jibe round the mark so must remember to put some decent loops on the ally pole release buttons. 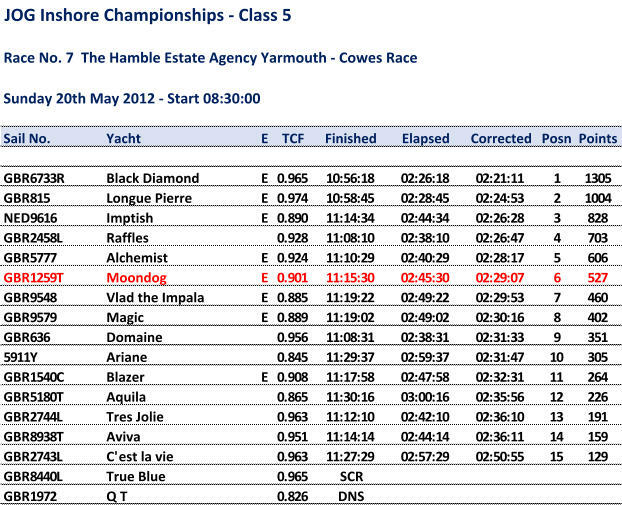 Still tight to the finish but kept the kite up and a better result than Saturday with a 6th place.